Dissatisfaction with your smile can have a profound impact on nearly every area of your life. If you are prone to hiding your smile or feel uncomfortable with the appearance of your teeth, your job prospects may suffer, your personal and social life may be stunted, and your general satisfaction may be diminished. But you don’t have to live like that. With porcelain veneers, you can have a smile that lets you feel your most confident, attractive and self-assured. Our New York City cosmetic dentists work with an industry leading master ceramist to craft porcelain veneers that are custom-designed to perfect and complement your unique smile and facial features. What’s more, the veneers we offer are durable, beautiful and capable of addressing myriad cosmetic dental problems to produce a smile you will be proud to show the world. To learn more about veneers in New York City or to schedule an appointment with our experienced cosmetic dentists, please call NYC Smile Design at 212-452-3344 today. Located in Manhattan, our cosmetic dentists welcome patients from all areas of NYC along with surrounding communities in New York, New Jersey, and Connecticut. With their ability to correct cosmetic malocclusion such as issues with tooth spacing and positioning, veneers are sometimes referred to as “instant orthodontics.” Indeed, for some patients, these cosmetic restorations serve as a wonderful alternative to more invasive orthodontic options. Porcelain veneers may also serve as a stand-alone solution for the correction of many cosmetic problems impacting a single smile – allowing them to provide a complete smile makeover in some instances. This will be discussed with you in greater detail during your initial consultation with one of our experienced and dedicated Manhattan cosmetic dentists. The best candidates for dental veneers are men and women who are unhappy with the appearance of their smiles and who are not experiencing oral health issues such as tooth decay, gum disease, or oral cancer. If you have a preexisting oral health issue, Dr. Tabib or Dr. Mello will need to address the problem before veneers can be considered. Contact Us to Learn if You are a Good Porcelain Veneers Candidate. We strongly believe that you deserve to feel confident and joyful when you smile, laugh and speak. If you feel self-conscious about the appearance of your teeth, you may not want to smile, or you may cover your mouth with your hand or shy away from social interactions. 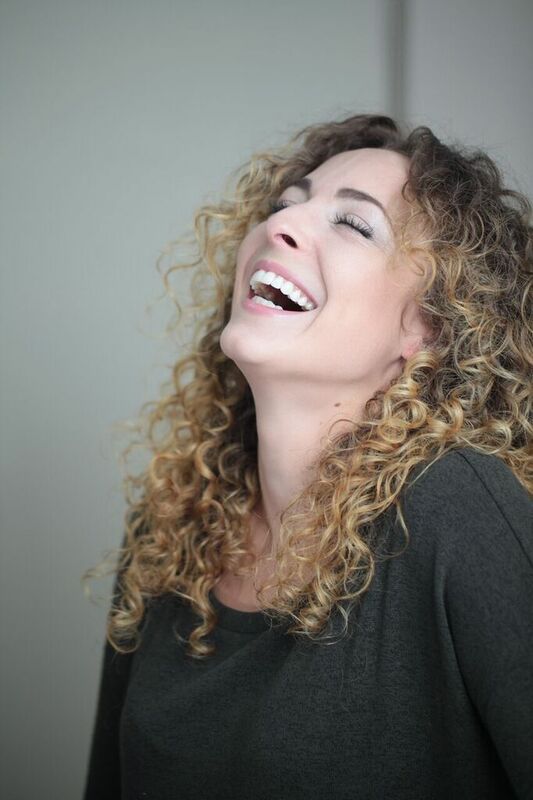 The way you feel about your smile has the capacity to affect all corners of your life, from your desire to pose for photos to your feelings of self-confidence in a professional setting. Dental veneers can rejuvenate your entire smile over the course of just a few dental appointments. The question of whether porcelain veneers are right for you largely depends on your own feelings about your smile. Our New York City cosmetic dentists approach treatment planning by looking at things from your perspective. If you feel unhappy with your smile, you probably know what changes you want to make. We will listen closely your concerns so that we can suggest the cosmetic dentistry treatments that will provide the longest-lasting results and that will allow you to live the fullest, most confident life. Veneers are placed over three to four visits to our Manhattan dental office. During your first visit, Dr. Mello or Dr. Tabib will listen to your concerns, evaluate your teeth and gums, and cover all of your treatment options. If porcelain veneers are the best fit, the planning phase can begin. Your second visit will be used to prepare your smile for your personalized veneers. 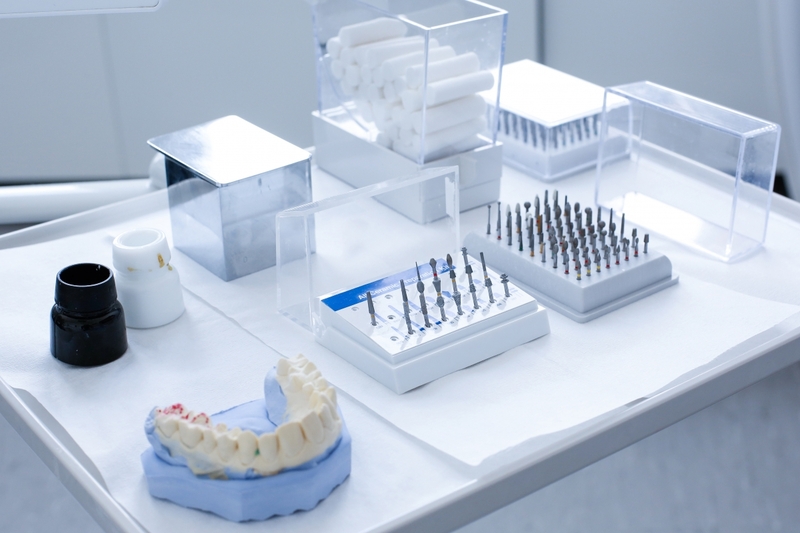 During this visit, an impression of your teeth will be made, allowing for absolute customization of your restorations, and tooth preparation will be completed. After your teeth are prepared for veneers, temporary restorations will be placed to act as placeholders until your permanent veneers have been created. We collaborate with our master ceramists for all the porcelain veneer treatments at our practice. Our master ceramists are Certified Dental Technicians, known for their prestigious skills creating ceramic restorations in New York. Once you and your cosmetic dentists plan your treatment, our master ceramists performs the actual fabrication of the veneers, which are then returned to us for the final placement. Our master ceramists craft veneers to our exacting specifications. Your veneers will be shaded, sized, shaped, and polished to fit seamlessly into your smile, producing a natural look that is complementary to your facial features and designed to fit comfortably into your mouth. On your third visit, we will remove your temporary restorations and replace them with your custom-made veneers, which will be fitted precisely for optimal results. In the very rare cases that customized veneers are not absolutely perfect, a fourth visit may be needed for final adjustments. We will discuss this and all other aspects of the porcelain veneers process during your initial consultation at our Manhattan office. The porcelain material used for dental veneers is durable and can last for many years, potentially decades, without needing to be replaced. The material also resists fading and staining. Once they do discolor, Dr. Tabib or Dr. Mello can replace your veneers one at a time and return your smile to lasting brightness. Because we choose the most advanced materials, the veneers we use have an attractive, lifelike luster and sheen. During your cosmetic dentistry consultation, we can cover advantages offered by porcelain veneers in more detail to help you determine if they are the best solution for your lifestyle. 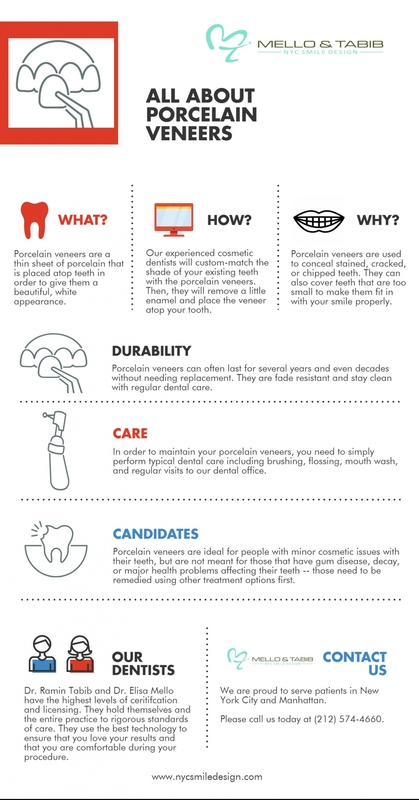 Do Porcelain Veneers Require "Special" Care? Not At All. One of the most remarkable things about porcelain veneers is just how easy they are to care for. In many cases, veneers require no adjustment to your daily routine, although there are some modifications that may need to be made. Taking care of veneers is just like taking care of your natural teeth. Brushing with a soft bristled toothbrush after every meal and flossing once or twice a day will help keep your veneers bright and attractive while helping prevent decay from forming underneath or alongside. Biannual visits to our Manhattan office are also recommended so that we can detect small issues before they become serious problems – both concerning your veneers and your general oral health. During these visits, Dr. Mello or Dr. Tabib will examine your veneers, underlying tooth enamel, and all adjacent teeth to help ensure lasting oral health and beauty. Dr. Mello and Dr. Tabib provide state-of-the-art dental care and results. You deserve an outstanding aesthetic result, but you also deserve the guidance of skilled cosmetic dentists committed to your individual goals and concerns. Our approach relies heavily on listening to you and seeing things from your perspective. We marry this patient-centered focus with advanced dental techniques to provide the most rewarding experience to everyone who comes through our doors. To schedule a consultation with one of our experienced cosmetic dentists, please call NYC Smile Design at 212-452-3344. We proudly serve Manhattan, New York City and all surrounding areas.